the press enthusiastically wrote about Jorge Lagunes’ NABUCCO at the Schwerin Castle Festival. 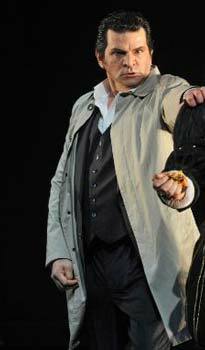 Before, he already enjoyed great success here as TONIO in I Pagliacci. Other international successes include GERARD in Andrea Chenier, GIORGIO in I Puritani, POSA in Don Carlo, ENRICO in Lucia di Lammermoor und ESCAMILLO in Carmen at the Washington National Opera, at the Royal Opera House in London, the Teatro Real Madrid, the Grand Théâtre de Genève, the New York City Opera, in Palma de Mallorca, Bilbao, Tel Aviv, at the Teatro de Bellas Artes in Mexico (Eugen Onegin, Marcello), in Santiago de Chile as MARCELLO in La Boheme, at the Deutsche Opera Berlin and the Opéra de Montréal as ENRICO in Lucia di Lammermoor, at the Cologne Opera House as AMONASRO, at the Budapest State Opera as RIGOLETTO a.m.o. Since his debut as as AMONASRO in Aida at the Finnish National Opera Helsinki in 2011, the baritone returned here as AMONASRO, TONIO and POSA. Jorge Lagunes personified GERMONT in Franco Zeffirelli’s new production La Traviata with performances in Busseto, Ravenna and Modena, a role in which he was equally successful at the Los Angeles Opera. As VIDAL he achieved particular success in the revival of Luisa Fernanda under the musical direction of Maestro Placido Domingo at the Teatro de la Cuidad in Mexico. 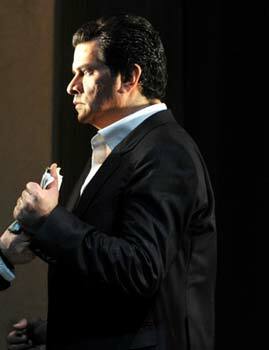 In autumn 2008 he was the first Mexican singer ever to perform in a Zarzuela at the Teatro Real in Madrid. In 2006 the Mexican-born singer was awarded the Placido Domingo Prize. The many distinguished singers and conductors with whom Jorge Lagunes performs include Anna Netrebko, Denyce Graves, Jonas Kaufmann, Ben Heppner, Francisco Araiza, Rolando Villazon, Ramón Vargas, Paata Burchuladze, Alain Lombard, Daniel Oren, Renato Palumbo and Placido Domingo. Jorge Lagunes has chosen the Mannheim National Theatre as his parent house. Since 2012 the baritone sings here such roles as POSA, JAGO, SIMONE BOCCANEGRA, SCARPIA, SHARPLESS, TONIO, ALFIO BARNABA in La Gioconda, JACK RANCE in Fanciulla del West, ESCAMILLO just to name a few. Jorge regularly returns to the Teatro de Bellas Artes in Mexico. Recently, he succeeded here as CONTE DI LUNA in Il Trovatore and JACK RANCE in La fanciulla del West. At the Basle Theatre he was RENATO and at the Teatro Colon Buenos Aires he sang MACBETH. Since 2015 he regularly performs at the Warsaw National Opera. He made his debut at the Dubai Opera in 2018 as AMONRASMO in Aida. With his bronze baritone voice Jorge Lagunes (Amonasro) made perceptible both the ferocity of the African warrior king as well as his fatherly affection. Spontaneously, Jorge Lagunes forms in depth Verdi cantilenas. It seems like he particularly grew up with them. Without any effort the baritone forms the wonderful legato lines. Even during Amonasro s furious outbursts his voice still remains melodious. In contrast Jorge Lagunes with his splendid voice seemed like a top casting in this relatively short part. A true Verdi baritone is Jorge Lagunes as Vincenzo Gellner, assuring his love, at first rather restrainedly, then most credibly. Apart from the choir, Sung Ha as Stromminger, Jorge Lagunes as Gellner and Tamara Banjesevic as Walter are particularly worth mentioning. Jorge Lagunes as Gellner left lasting impressions with his elegantly sounding baritone voice, exhaling both melodious lyricism and powerful splendor of sound. Jorge Lagunes can easily compete with her. 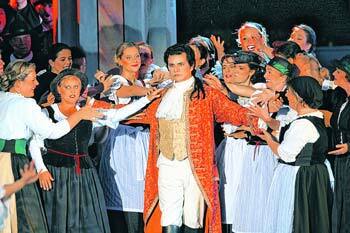 He sang Gellner with a full, sonorous and generously timbred baritone voice, which perfectly suited the role. ...whose acting and singing was equally brilliant as Jorge Lagunes. '... and the Mexican Jorge Lagunes both gave first-class interpretations of their roles.. They not only succeeded in singing all the finesses of their extreme tessituras with fire and high musicality, they also cunjured up some real contraversial and emotional flesh-and -blood characters on stage. Jorge Lagunes' portrayal of Nabucc, sung with his full, dark baritone voice, was one of the highlights of the evening. In the second part he succeeds in heightening the vocal and dramatic tension.